XS936 first took to the air on 31st May 1967 and was delivered initially to 60 MU. Entering service with 23 Squadron, she also served with the 11 and 5 Squadrons and the LTF, finishing her active career with 5 Squadron. Bought by Roy Flood when put up for disposal, he had her mounted here on the forecourt at Castle Motors. 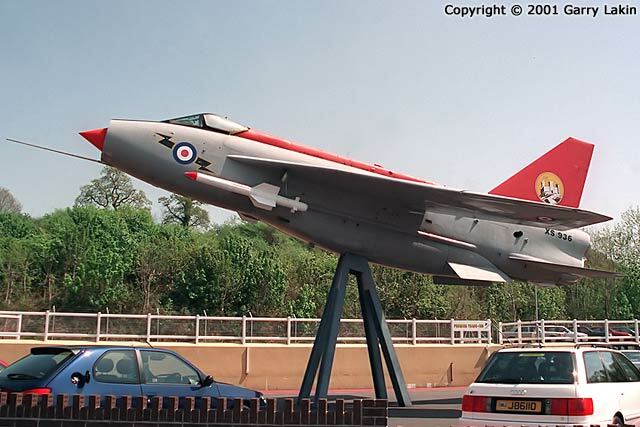 The adjacent A38 road even has a 'Low flying aircraft' sign just before you reach the turnoff for the garage... for the helicopter charter operation there, sadly not for the Lightning! She is stripped out (no engines for instance) and wears a decidedly non-authentic paint scheme but makes a hell of an impression regardless. She has been well looked after and regularly cleaned and painted over the years but recent photos have shown corrosion taking hold, with rust streaks on the missiles, various spots on the underside and along the spine.